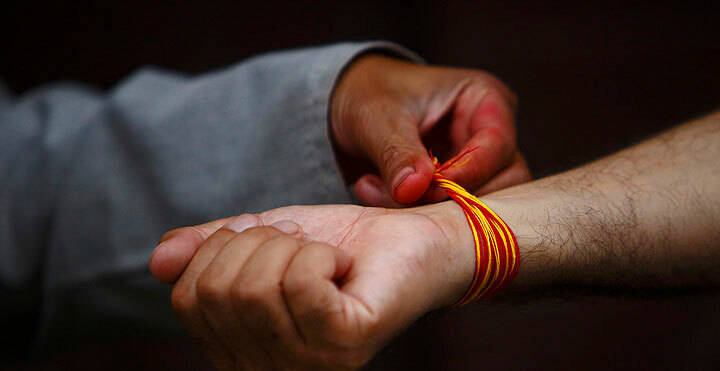 The day also marks another holy festival Rakshya Bandan when men, women and children regardless of station and caste tie doro (a sacred yellow thread) around their wrist as a symbol of protection from fear and disease. Raksha means protection and Bandhan means a bond, hence, the doro is tied by a Hindu priest intoning a quick prayer which goes, ‘Thus I tie the Raksha round your wrist, the same which bound the arm of the mighty Bali, King of the Danavas. May its protection be eternal.’ With a belief of bringing good luck, the entire family gathers around a priest to tie the sacred thread; men tie the thread around their right wrist and the women tie it on their left wrist. It is believed that this thread should only be removed on Laxmi Puja, which falls three months later and tied to the tail of a cow. Thus when death comes to the wearer the cow will help him/her to cross the river Bhaitarna, by allowing the dead to cling to her tail. Many legends are associated with this pious festival and among them; the myth of Bali is widely imitated on the propitious day. The day might be a reminder of the extraordinary acts of charity performed by King Bali- the king of Danavas (demons). The King had taken the vow of charity, according to which he would grant every wish made to him. His deep devotion and boundless benevolence won him a place higher than Lord Indra- King of heaven. Seeing their realm under a demon, the gods prayed to Lord Vishnu. The Lord came to their assistance disguised as a dwarf and begged Bali for as much land as he could cover in three strides. After Bali’s agreement, the dwarfed Vishnu swelled to the size of a tremendous giant and in two mighty strides stepped across Heaven and Earth. When he demanded where he might take the promised third step, Bali who had already recognized Vishnu placed the giant’s foot atop his own head and was pushed far into the bowels of the earth. In this way, Lord Vishnu restored the three worlds to the rightful ruling gods, and repaid Bali for his last act of earthly charity, by making him the King of the underworld, where he is believed to be still ruling. To mark the day, Hindu pilgrims visit Gosaikunda, a holy shrine of Lord Shiva, situated at mountains north of Kathmandu, and take a dip in the sacred lake with a belief of purging their sins. As part of Janai Purnima celebration, a grand festival takes place at Kumbeshwor Mahadev Temple in Patan. An idol of Lord Shiva is placed in the middle of the pond of Kumbeshwor where people take a plunge, perform puja and watch religious fairs. 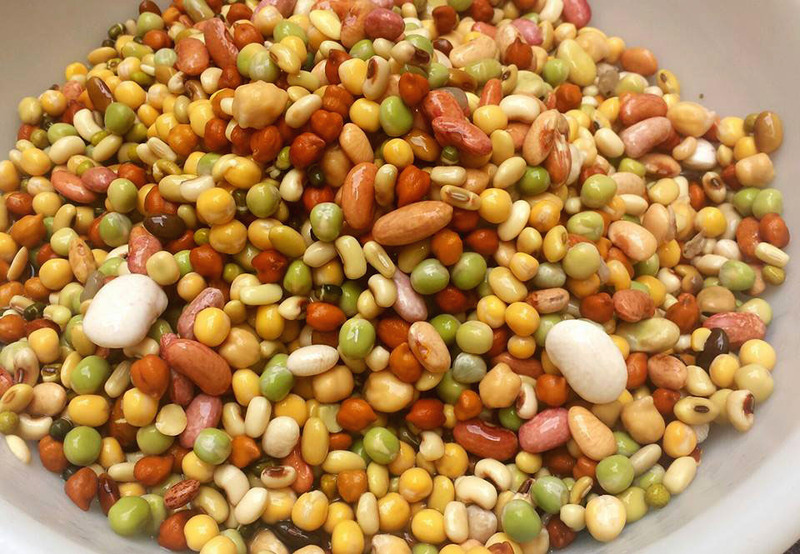 On the day, a special dish – Kwati- a soup prepared from nine different beans, and different variety of traditional Nepali food is served at homes. The soup is highly nutritious which keeps diseases away and all family members come together to eat Kwati and to celebrate the festival. Moreover, the Newar community marks the same day as the beginning of the nine-day festival called Gunhu Punhi. The Newars coat the threshold of their houses with mud and offer food to gods and food and bougainvillea (gunakeshari flower) to frogs on banana leaves. Likewise, in the Terai region, the day is celebrated as Rakhi festival when sisters tie Rakhi (a thread signifying bond of protection) around their brothers’ wrists wishing them long life and prosperity and in turn, brothers give gifts to their sisters as an assurance of protecting them from all impediments in life.The colorful festival of Janai purnima observes the bond of purity and security. As Janai Purnima is on the way, iMartNepal .com provides you various kinds of handicrafts items which you can gift to your siblings and relatives. It helps you to celebrate Janai Purnima in Nepali traditional style and culture. We express our warm wishes to you all in the special occasion of Janai Purnima.